Backdated post - I’ve got another trip up to Thailand. Yes! Yayyay! Thus, I’m thinking if I should do some discovering in this trip. I’m looking to try something different. Initially, I was thinking of relaxing at one of the islands but the best island are cropped at the southern province of Thailand. The better way to make my way there would be by taking the domestic flight. Else, I would have to endure 6 hours of bus trip. I would like the idea if time weren’t a constrant. Actually, I don’t really go because I miss the islands so much but because I haven’t experienced islands in Thailand. However, islands and beaches appear to be almost the same to me unless I’m into scuba diving. Not much could be done if one is not looking to immerse in water activities and soaking up the sun. I get to know this Chok Chai Farm in Pak Chong, Korat which is really nice. It’s a cattle farm open for tour visits. Not sure if I would like it, but milking cow sound interesting and new. “You want milk, you’ve gotta get it DIY, eh” Along with that, we’ll see how the farm is run and how the cows are being guarded by a dog. I don’t like visit farms but why does this appeal to me, coz it’s my line of work? I suspect so. And no, I don’t milk cow for a living nor do I run a cow farm. Back to this farm, there’s a ice cream making workshop and straight from the farm steak and dairy servings. The Chok Chai Steakhouse Chain may not be familiar to you but a local favourites for quality thick slab of juicy beef steak. Other than that, maybe I could drop in at the Epimai Historical Park and the water park. It seem to worth a visit based on my research online. “What else which I can get myself involved?” I began thinking... Then, something stroke me, why not try out Muay Thai. I’ll sign up for a full day trainng of this. The constant knee and leg kick will definitely tone my big fat thighs and pectoral. 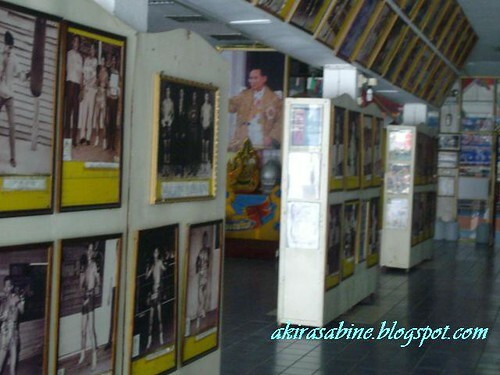 Then, one fine Sunday I finally stepped into the local Muay Thai Institute where I stayed. It was pretty quiet. No one could be seen. The only person was in the air-conditioned office with his focus on the Sunday boxing matinee show on TV. 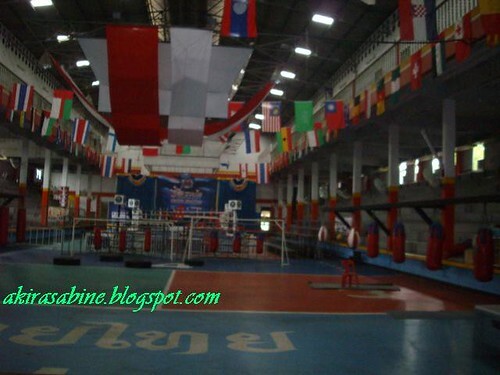 “Hi, I’m here to attend a one-day Muay Thai Training ^_^,” I introduced. At 1.30pm, the students came in one by one… by one and by one. They jogged around and they jumped on the used tyres as they loosened and warmed themselves up. Then, it was followed by some air punches and kicks to improve their poses and body coordination. I joined them but specially trained by an uncle who seemed to take pride in his past achievements. He shared with me stories of his past championships and how he had progressed. Well, I would be disrespectful to show my disinterest but that only encouraged him to carry on and on. Muay Thai is indeed more dangerous than boxing. Firstly, it’s boxing without Personal Protective Equipment or PPE. The boxers are not protected with head and body gears. Secondly, kicking is not just a fault but spices up the so called Thai Boxing. If you can’t give an instantaneous reflex defense by lifting your knees, you’ve got to prepare to get bruises on you waist down. My one day lesson gave me some insights on the essential attacks on Muay Thai which uses the head, elbows, punches, kicks, knees to hit the weak spot of a human body. This looks like a budding Muay Thai boxer. The next Somchit maybe, to bring back another Olympic boxing gold medal for Thailand.